Usually, I use TVUPlayer to watch some Chinese TV shows, but sometimes I need record these TV show while I left computer. 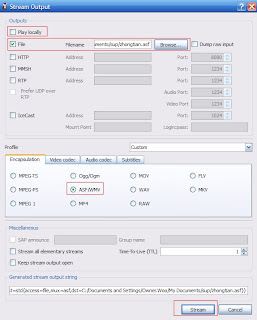 I remember I had an article that introduced about how to stream TV live show with TVants (another P2P online TV client) and VLC Media Player. But I did not find a same way to stream live TV show with TVUPlayer at that time. Actually, I spent a lots of time to try find a way to stream TV show with TVUPlayer. Finally, I got it, and use same way (TVUPlayer and VLC Media Player). Just follow some steps below. Of course, you need two software TVUPlayer and VLC Media Player 0.9.2, they both are free software. 1, Open TVUPlayer choose your favorite channel, wait a moment till the picture on screen on TVUPlayer. 2, Open VLC Media Player, click "Media" tab, pick "Streaming" on extension menu. 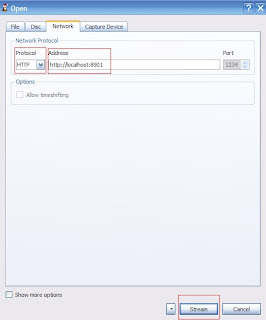 Choose "Network", in "Network Protocol", pick "HTTP" under "Protocol". Under "Address", fill http://localhost:8901 into address bar. 3, Click "Stream" button. It will open another window, on "Outputs" section, pick "Play locally" if you like watch it same time, and pick "File", on "Filename" click "Browse" button, choose a folder that you want save video file. Important: take a name for your file, and add .asf extension format. 4, On "Profile" section, choose "Encapsulation", pick "ASF/WMV". Click "Stream" button. That is all you have to do. Remember, you must keep TVUPlayer play show while you stream file. If you want change TVUPlayer channel and stream a new show you have to do same steps again, and change file name or path.